Probably no one has done a better job of remaining unscathed by association with the administration of Donald Trump than Vice President Mike Pence. 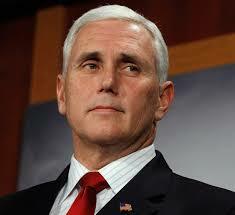 In that capacity, Pence has acquitted himself quite well in the aftermath of a rocky term as Indiana Governor. The problem was the Trump-Comey talking points were not true. Journalists began digging and found that the Comey firing was because of every increasing Trumpian furor over the continued Russian investigation led by Comey. Indeed, Comey had just requested it be expanded, with additional financial and personnel resources devoted to the investigation. The Rosenstein memo turned out to be after-the-fact cover for the decision. The problem for Pence is that he was in the meeting during which Trump announced his plan to fire Comey, a meeting at which Trump requested Rosenstein write a memo to offer a false motive for his action. So when Pence was on Capitol Hill he was knowingly offering a lie about how President Trump arrived at his decision. The White House has since admitted the original tale spun by the Trump spokespeople, including Pence, wasn't true. Pence's loss of credibility is a most unfortunate development. I would rate the odds better than 50-50 he will be President before the official end of Trump's term and that he will lead the Republican ticket in 2020. His being damaged by his actions as Vice President further hurt GOP efforts to keep control of the White House and the Senate. As far as the U.S. House, that most likely be won by the Democrats in 2018. A Quinnipiac poll released yesterday showed that Americans by a 54-38 margin Americans want Democrats to win control of the U.S. House in 2018. That 16 point spread is by far the widest margin ever measured on that question. Pence had a good reputation? When? Nothing says I'm a Christian like taking health care away from poor, sick, old people and give a huge tax break to the wealthy. Pence will burn in Hell.